PSGUI v0.5 new Editor! Colors! and more! i have very nice news for you! I managed to exchange the integrated Text-editor of PSGUI with AvalonEdit. Also i did lots of BugFixes, added some Examples and some new little functions – like the Button “Open in ISE”, which opens all 3 DialogFiles in the Powershell_ISE or the “Open”-Button for the Dialog-Folders and also some improvements in the dialogs for “New-Dialog” and “Rename-Dialog”. A imporant hint here – to create new Dialogs or rename Dialogs you have to start the PSGUI-Manager with Admin-Rights. For example – out of a ISE / Powershell console, which has been opened with Admin rights. I will address this topic later on. 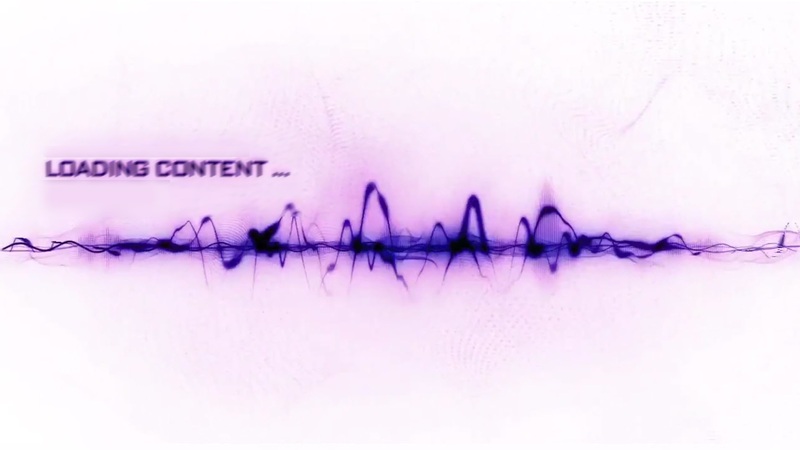 I personally think, that this was one of the most valuable changes in the last time. But keep tuned – lots of functions are still planned, before we get to version 1.0. Installation is now as easy as any possible – with PowershellGallery – described here. i have been asked to create a little intro to the project PSGUI. So in this post i want to show you step by step how you can work with PSGUI and get it to work. 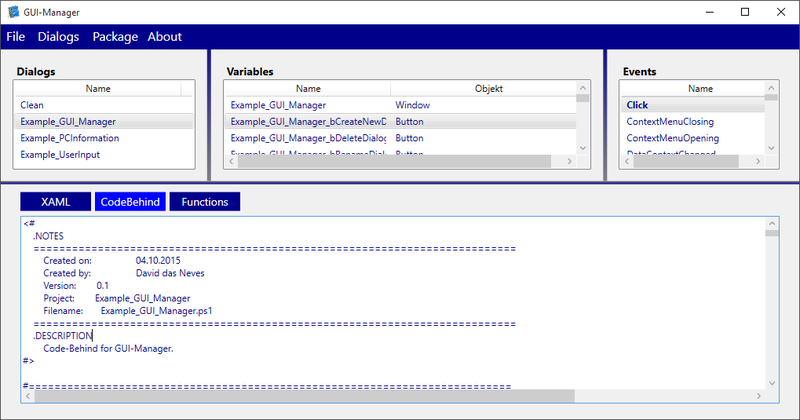 today i want to show you, how you can debug XAML GUIs created with PSGUI. And to be honest – this is absolutely easy! You don´t think so? Take a look below. PSGUI v0.2 – Next Round – Powershell vs. XAML – Fight! today i have pretty good news for you! Long time ago i started the project PSGUI, but i had not much time and power to create a stable version, because i had been working and training hard for Microsoft in the last months. But – luckily i had again some time to get progress in this nice project and here is the next version! But what was actually PSGUI about? Below a short summary – detailed instructions will follow. some time passed since my last update, but now i am arriving with a whole bunch of demo scripts for everyone. My good friend Sebstian Klenk, Technical Evangelist Microsoft, did two interviews in german with me and summed everything up in his blog. There you can get also the material of my sessions and more – i recommend the demo Scripts of the GUI Session- but keep in mind that not all of the examples were written by me but i personally did not want to keep them out. if you work with more complex scripts behind the GUI you will come to a point, where you want to make changes to the GUI appearance within the CodeBehind-file. An example herefore would be the usage of a progressBar. But how can this be done? The variable (here: $GUI_Manager_rCodeBehind) is the object from which you want to raise the event. In the parameters you have to insert your event in the ArgumentList. This example is for a ButtonClick event – [System.Windows.Controls.Button]::ClickEvent). May be you will need it at some point. today i want to show you one of the most essential and powerful ways to fill a GUI with life. Bindings. in the previous post i described what a dialog consists of and introduced the module PSGUI. Now i will show you some features which will work mostly at the loading time. 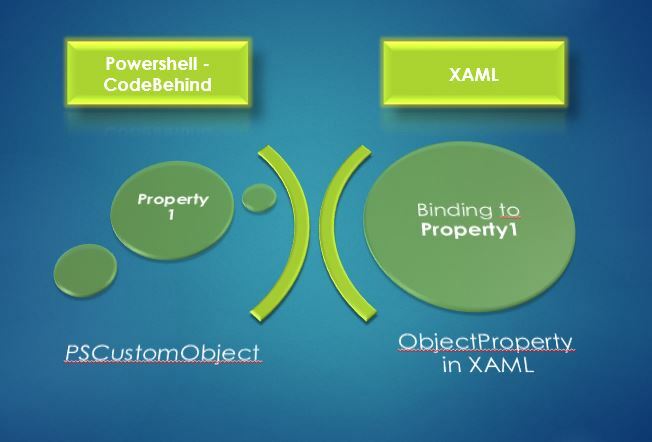 Easy creating Powershell GUI with XAML? PSGUI! 3 months ago i started a project to create user interfaces for Powershell with WPF as simple as possible for everyone by using a – POWERSHELL GUI. Many times there had been administrators, customers and friends who asked for a GUI in PS. Probably the loudest group crying had been the administrators who normally should work easily with Powershell. But IT-guys are lazy – and because of these laziness we create powerfull scripts which make life easier. And if a wonderfull looking GUI is on top of this functionality – even better! Though you should never forget – by adding a GUI to a module / function of yours you can prevent lots of input errors by the user. The user gets happy because he can click and sees a wonderful design and you can add an additional abstraction layer preventing lots of headaches. Interested? then take a look into!